Tumors can come in many different forms; some more troublesome than others. A certain type of tumor called an acoustic neuroma is notorious for contributing to facial paralysis due to its proximity to the facial nerve. 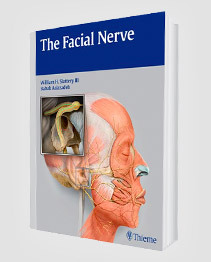 When considering treatment, Acoustic Neuroma patients should seek the help of a facial nerve expert like Dr. Babak Azizzadeh to ensure that they get the best outcome possible. Dr. Babak Azizzadeh is a world renowned surgeon who specializes in treating patients with various forms of facial paralysis. He is a pioneer and leader in the facial nerve arena and is has become well known for his work with both adults and children. Dr. Azizzadeh is double board certified in otolaryngology and facial plastic surgery which gives him a unique insight into both the aesthetic and function of the facial nerve. After completing his specialized training at Harvard Medical School, Dr. Azizzadeh founded the Facial Paralysis Institute. He is also the founder and director of the Facial Paralysis Foundation, a group which offers information and support for patients and loved ones affected by facial paralysis. 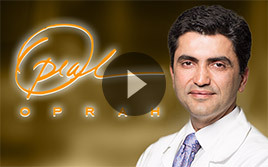 Dr. Azizzadeh has been featured in various media outlets including The Doctors, The LA Times, The NY Times, and the Oprah Winfrey Show. He has written 6 best-selling medical textbooks including the widely recognized The Facial Nerve. Dr. Azizzadeh is deeply committed to helping people from across the globe regain their facial function and smile, making him one of the most highly regarded surgeons in the world. An acoustic neuroma is a type of benign tumor that develops on the eighth cranial nerve (also known as the vestibulocochlear nerve). This nerve is responsible for connecting the inner ear to the brain. As a result of treating the acoustic neuroma surgically or it becoming too large there are a variety of side effects that patients can develop. Most commonly people report experiencing partial or complete deafness, imbalance, headache, numbness and occasionally facial paralysis. 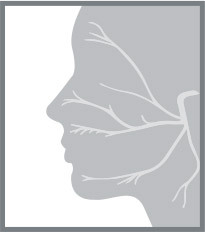 If facial paralysis develops, there are a host of things that the patient needs to be aware of. Facial Muscles: If a patient develops facial paralysis, they will lack the ability to control muscle movements on the affected side of their face. They may also develop synkenesis or an extreme tightening and mis coordiantion of their facial muscles. Eyes: Unfortunately it is common for patients who have facial paralysis are a result of an acoustic neuroma to develop eye problems. These issues can include decreased eyelid mobility and tear function which can lead to dry eye and irritation. Mouth: Patients who have had an acoustic neuroma also commonly experience oral complications such as muscle weakness, which changes the way that patients eat, drink, talk, and smile. Patients who experience numbness often bite the insides of their cheeks which lead to ulcerations that require care. 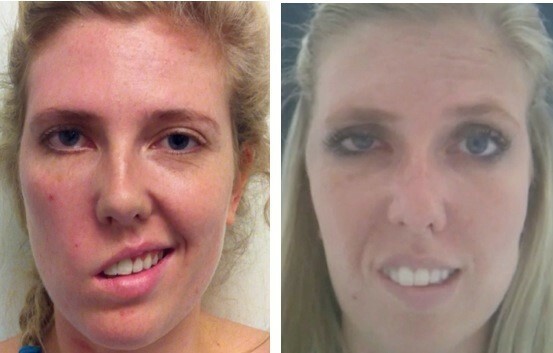 Facial Muscles: If a patient does not regain facial movement or suffers from severe synkinesis​, they may benefit from a nerve transfer surgery. 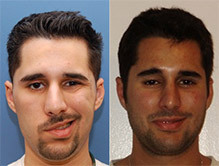 Depending on the individual, Dr. Azizzadeh will be able to determine what procedure will be most beneficial. Some of the procedures that he commonly recommends to treat facial paralysis for acoustic neuroma patients are Hypoglossal-Facial Nerve Transfer, Masseter-Facial Nerve Transfer, Gracilis Muscle Transplant, Temporalis Tendon Transfer, or surgery for synkinesis. Eyes: Dr. Azizzadeh works closely with another world renowned oculoplastic surgeon to help manage eye care for acoustic neuroma patients with facial paralysis. Some of the methods used for restoring eyelid function are gold eyelid weights, platinum chains, eyelid springs, and tarsorapphy. Mouth: Dr. Azizzadeh recommends that acoustic neuroma patients are followed closely with a dentist who can address their oral care on a regular basis. Home dental hygiene such as brushing and flossing as well as routine dental exams are extremely important to ensure that facial paralysis patients are able to maintain good oral health.